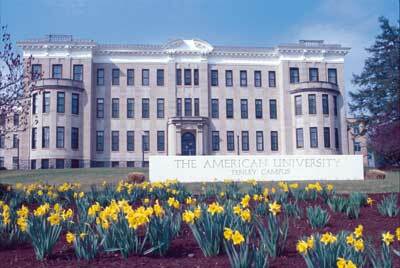 American University is a private, Methodist university in Washington, D.C.. The university has about 9,940 students. It was founded in 1893. The current president of the university is Cornelius M. Kerwin. The athletics teams of the university are called the Eagles. They have 9 varsity teams and they compete in the Patriot League. The Jack I. and Dorothy G. Bender Library and Learning Resources Center sits at the top of the Eric Friedheim Quadrangle. American University Facts for Kids. Kiddle Encyclopedia.